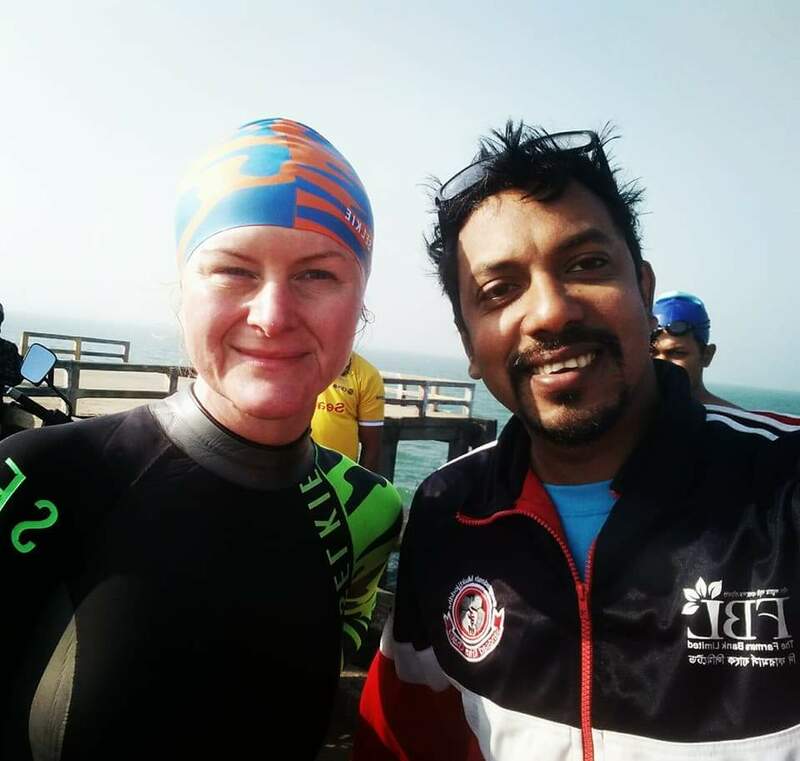 Our club is full of inspiring individuals and we wanted to share a story from one of our Members, Becky Horsbrugh, who recently swam the Bangla Channel, a 16km openwater sportive. Not only has she raised a huge amount of awareness for a cause very close to her heart but now over £2,200 pounds in fundraising for CIPRB (Centre for Injury Prevention and Research, Bangladesh). It’s truly exceptional story of compassion, dedication and triumph and we are so proud to be able to share her achievement! I first got involved with triathlons in the late 1990s and was lucky enough to go to the Sydney Olympic Games in 2000 to cover the sport as a journalist. Since then I have dabbled on and off with the sport, though for the last ten years have mainly been swimming. I moved to Hackney the year before the London Games and got involved with London Fields triathlon club when I saw the team training one day at the lido. Sadly a serious illness the end of 2016 meant I was out of action for almost 6 months, but last summer I got back on my bike/in the pool/in my running shoes again and also completed my swim teacher training. Since then I have coached extensively at West Reservoir for Swim Open as well as pool based lessons elsewhere. The only drawback with that is not being able to make club sessions! However I hope to attend and coach sessions for LFTC again in the near future. I dabbled in triathlons 20 odd years ago when they first became popular, but then very much concentrated on just swimming until I discovered London Fields Triathlon Club around 3-4 years ago and thought to try my hand at them again. Unfortunately in the summer of 2016, just as I was getting to a good fitness again I was very ill and ended up in Homerton Hospital 4 times, resulting in a 5 hour operation in which part of my bowel was removed. Not too nice! That meant 5 months of no exercise at all and even when I returned to the pool in January last year I had to take it very easy. During my recovery I had plenty of time to read as I was stuck at home not being able to move much. One day I came across an article about drowning in Bangladesh, and was astounded by the figure of 50 children dying there every day in the water. I am a qualified swim teacher as well as a journalist and I really wanted to do something to help. 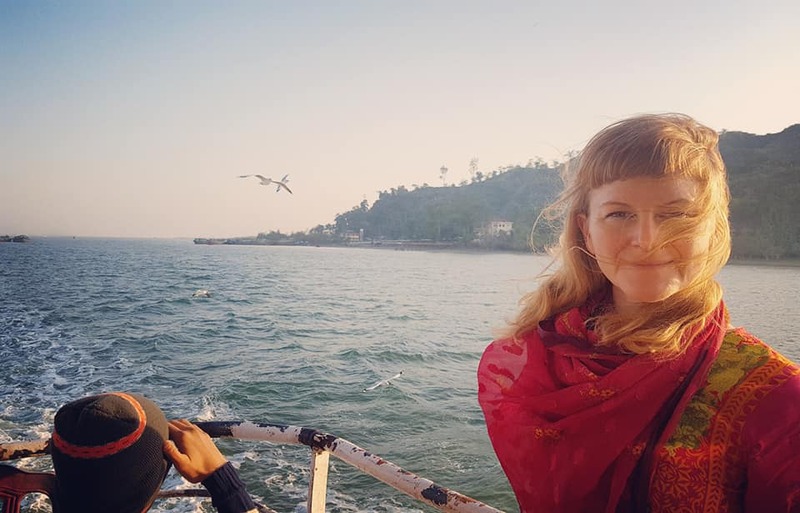 I found a place called Sreepur Village, north of the Bangladeshi capital which is a British run charity for women and children who have had some trauma in the their lives. I got in touch with them to see if I could help with swim lessons at all. They quickly replied saying that they actually had a scheme called SwimSafe running there in the summer but I was welcome to come and visit and help out. So in July last year I did just that. The schemes are run by an organisation called the CIPRB (Centre for Injury Prevention and Research, Bangladesh). Each child has to be able to swim a minimum of 25 metres, float or tread water for 30 seconds and perform a dry land rescue to pass their minimum level. Enough essentially to save themselves if they found themselves in trouble. It was an incredible experience and as soon as I got back to the UK I wanted to do more to raise awareness, but wasn’t sure how. 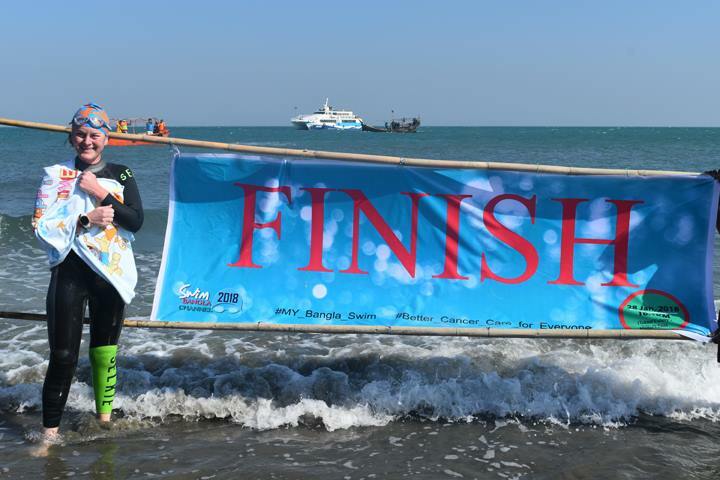 Then one day I came across a Facebook page for something called the Bangla Channel Sea Swim, a 16km distance from Teknaf to St Martin’s Island. It looked amazing. 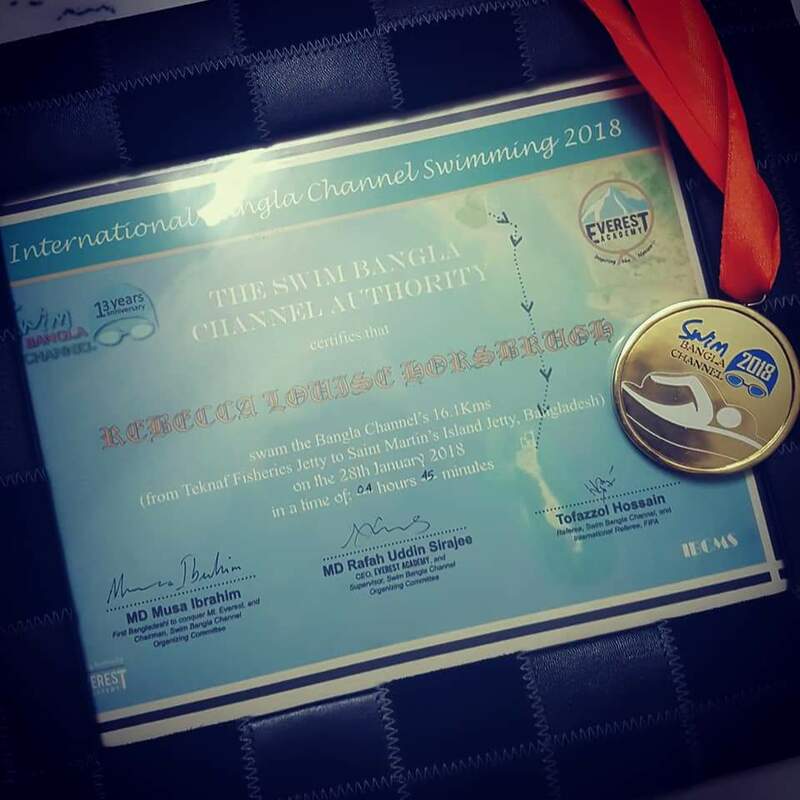 I contacted the organisers for more details and found out that several Bangladeshis had done the swim, plus some Indian swimmers and a Dutchman – but no British swimmers! The furthest I had swum at that point was around 7 to 8km in a river, but I felt with the right training I could do the distance. It seemed the perfect vehicle to raise awareness of drowning issues and the swim schemes, so I duly signed up. I had around 5 months to train…As London Fields Lido was closed during most of that time, there were no club swims at the weekend. So I joined SwimforTri for one session a week and then did 3 other swims in my own time. No session was over 5km in distance but all involved various drills, endurance, speed and technique. My biggest drawback was the timing of my big swim – having to do all my training in the pool rather than open water. The months passed by and then finally the time came to go to Bangladesh. I flew out a week before the swim. 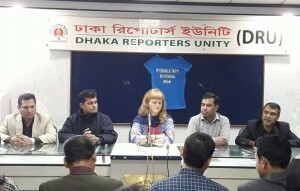 My journalist colleagues in Dhaka helped me to put on a news conference before I flew out to the coast and I was amazed to learn so many of the local journalists were unaware of the big issue of drowning in their own country. Two days later I flew down to Cox’s Bazar on the coast, where I stayed the night before meeting early the next morning with my swim team. We all took a bus 2 hours down the coast to Teknaf, and picked up a ferry to St Martin’s island in the Bay of Bengal. Two other members of the team had decided to do the swim as well with me and on our arrival we did a test swim which gave us some confidence as the environment felt good and the water temperature was around 20 degrees. However we had been warned the weather could turn, and when we all woke at 4.30am the following day the wind had really picked up! We travelled back to Teknaf to begin our swim in our support boats, which were open to the elements. We all got totally soaked and cold as the waves battered against the sides of the boat and then over us. I began to feel concerned as I knew if I started the swim cold there was no way I could complete it. 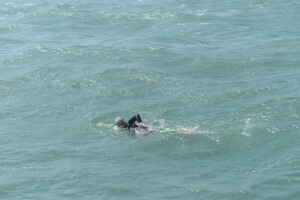 I had my wetsuit with me and decided I had to wear it if I had any chance of completing the swim. On arrival at the start point, I quickly got out the boat and wiggled into my suit. My two fellow swimmers and I were still shivering so we ran up and down the jetty several times, desperately trying to warm up! The heat of the rising sun did help as well and soon we were down at the water’s edge, ready to begin. Once the water was around waist high, we all said good luck and then began to swim. The first hour seemed to take forever and the waves were swirling around me, as I battled hard through the water. A cold wind was blowing across the surface as well. I was stung a couple of times by jellyfish – on my face and my ankle – but the pain didn’t last for long. I felt disorientated, but kept on following the boat ahead of me. I could see nothing but sea and sky. I’d agreed to take water breaks every 45 minutes. I felt big relief on the first break, as a bottle was thrown to me on the end of a rope. I drank what I could and then set off again. I then got into a rhythm and the time seemed to fly. I had no idea what speed I was going or how far I had gone. The water and food breaks flew by until I hit the 3 hour mark. I was amazed I was feeling so good after that amount of time. I then saw the other two swimmers on the boat and realised they had had to get out due to cold and injury – leaving just me in the water. At that point we reckoned I had about an hour left to go. But I found out after I soon got stuck in the changing tides and spent an hour swimming, but not moving. I could see the island ahead of me but it took an age for it to get closer. Finally I could see the beach! And finally, ‘finally’ I could see sand beneath me, and I was able to stand. I walked up the beach, surrounded by an inquisitive crowd and posed by the Finish line for photos. I couldn’t quite believe I had done it, in 4 hours and 45 minutes and besides a sore shoulder didn’t feel that bad at all. That evening we had a big celebration in our hotel, and I went to bed thinking well now I can really enjoy the rest of my holiday in Bangladesh. Little did I realise however how my swim had really captured the hearts and minds of so many Bangladeshis. 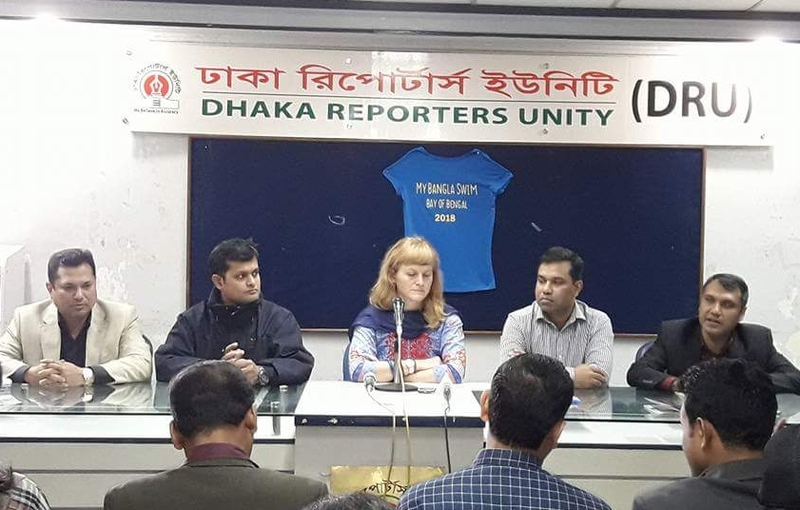 I work as a journalist for the Associated Press and I am very lucky to have great colleagues also in the Bangladeshi capital, Dhaka. They started sending me newspaper links all about myself and the swim. I seemed to be a bit of a star! The first British person to swim the Bangla Channel for the children of Bangladesh. As I made my way back to Dhaka people were stopping me and shaking my hand and saying thank you, you are an inspiration. You are a hero to us for doing this for our children. It was so overwhelming to hear people say things like that and something I could never have imagined would happen. Back in the capital I appeared on a TV chat show and did numerous newspaper and TV interviews. A truly memorable time. Not only had I completed my challenge but people were really becoming aware of the importance of learning to swim. 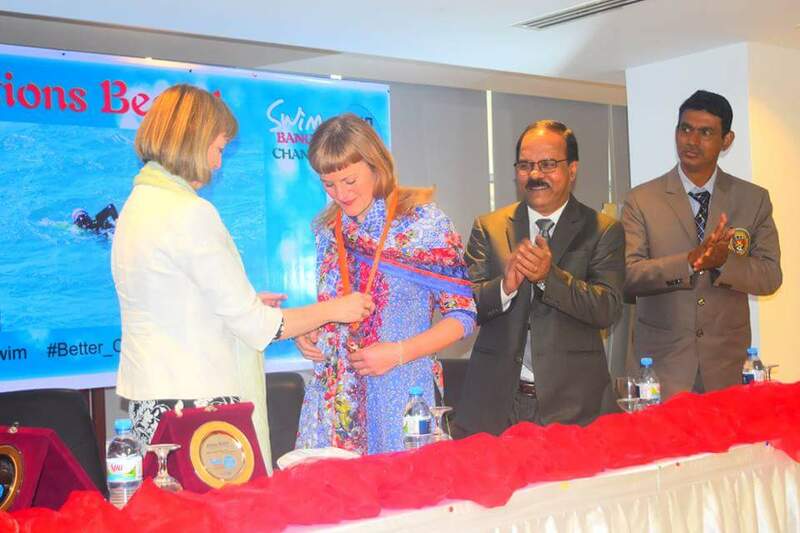 I hope to return again soon, using in many ways my new found ‘fame’ in Bangladesh to continue to raise awareness of the issue of drowning. I hope one day too I can work full time in this area. I never thought I would be capable of doing something like a 16km sea swim so many thousands of miles away, but it shows with the right training and right mindset we can achieve far more than we ever think we are capable of.